How to watch Phantom Boy (2015) on Netflix Taiwan! Sorry, Phantom Boy is not available on Taiwanese Netflix, but you can unlock it right now in Taiwan and start watching! With a few simple steps you can change your Netflix region to a country like USA and start watching American Netflix, which includes Phantom Boy. We'll keep checking Netflix Taiwan for Phantom Boy, and this page will be updated with any changes. Phantom Boy is not available in Taiwan BUT it can be unlocked and viewed! A boy whose illness allows him to float outside his body uses his newfound skill to help a cop take on a madman who's terrorizing New York City. Getting sick gave him unexpected powers. Now, this 11-year-old kid could become New York City's biggest hero. There is a way to watch Phantom Boy in Taiwan, even though it isn't currently available on Netflix locally. What you need is a system that lets you change your Netflix country. 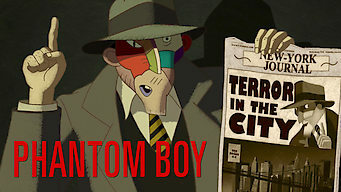 With a few simple steps you can be watching Phantom Boy and thousands of other titles!